As funding budgets shrink, many historians face increased pressure to make the most of their time in distant archives. For a number of years now, a lot of researchers have favored a good digital camera, which (theoretically) allows for a faster gathering of primary source materials than traditional note-taking methods. Of course, as historian Larry Cebula humorously observed, failure to exercise good digital stewardship with your own personal archives can have disastrous consequences. Some historians remain loyal to tried and true methods – note taking either with notebook and pencil, or with a laptop. For the technologically inclined, there are a number of new options. Most of the new technology involves smartphones or tablets. I favor an iPad mini, in part for its battery life, and in part because I am an Apple user in general, and like the easy compatibility across all my devices. Other historians I know who swear by Samsung’s Galaxy or the Google Nexus. New to the technology game? If you are in the market for a tablet, my advice is to ask trusted colleagues what they like, and look at reviews on a technology site like C-Net. There are also a number of new technologies that can be used either to facilitate the research process, or to help you organize your research and your thoughts as you go. While technology can certainly present dangers of collecting so much that you don’t remember what you have, when used judiciously, it can help you get through a large volume of archival research in a short period of time. During a recent research trip, I was able to get through 80 manuscript boxes in 5 days. Of course, every institution sets their own policies about what research may have in their reading rooms. The AHA has a crowdsourced Archives Wiki that can help you plan, but it is always wise to double-check with the reference staff at any repository to verify their current policies concerning technology use and copyright before you go. Some allow photography/scanning if it won’t harm the collections. Some charge a daily or weekly fee (bring cash!). Others may not allow it at all. Note: Some of these links go to the Mac version of the app, but they are all available for PC/Android users. Genius Scan (Grizzly Labs) works with a tablet or cell phone to take pictures of documents, and will render convert the files into single or multi-page PDFs. It also has OCR and tagging capabilities. With the Plus edition, you can export your files to email, a cloud server, or Evernote. The app will warn users when your PDF hits 30 pages, since larger PDFs can be more difficult to export. Depending on the richness of the collection, and the type, it may be useful to make a new file for each file or box, with a file name that documents where you got it. There is a free version of this app, which allows for tagging and emailing documents, but does not have the capacity to send to Evernote or your cloud server. TurboScan (Piksoft) lets researchers use a tablet or smartphone to scan documents to JPG or PDF, and email the files to themselves. For an additional $1.99, Piksoft also has an OCR app that has earned favorable reviews from users. Some historians have noted that they prefer JPGs to PDFs, because they can be more easily blown up on a screen and their brightness and color can be manipulated. Regardless of what you prefer, it is still advisable to bring a notebook or laptop where you can keep any additional citation information you need, as well as thoughts that may come to you while you research, so you can go back and review them when you are in writing mode. Evernote is a multi-function database program that allows users to take notes, save and upload images, annotate your PDFs, and other handy research functions. Because it’s cloud-based, you can access your files anywhere. The basic service grants users the app and up to 60 MB of storage space, and some basic functionality. A Plus subscription ($24.99/yr) gives you 1 G of storage space and additional features, like the ability to save emails. Premium account users have unlimited storage space and full access to handy features like the ability to annotate your PDFs. Zotero is a database program that is the brainchild of the Roy Rosenzweig Center for History and New Media at George Mason University. It lets users store, organize, tag, and cross-reference their files and images, which is particularly useful for researchers engaged in a book project. It is a powerful workhorse app program can also aid your research. It can sync across devices, and has the ability to sense when you are working on a larger project and automatically find and save bibliographical abstracts that might be of use to you. For researchers, the advantage is that you can cross-reference and organize your primary and secondary sources as you go along in your research. Users get up to 300 MB of storage for free. 2 GB of storage costs $20 per year. 6 GB costs $60 per year. Unlimited storage is $120 per year. Scapple is a flexible flowchart mapping technology by Literature and Latte, the people who brought you Scrivener. It functions like a digital marker board, and allows users to map out connections as they organize their thoughts. Like most historians, I have already spent time in the secondary literature before I hit the archives. If I have a brainstorm mid-collection, or some downtime as I wait for a request to be retrieved, this software can be a very nice way to start organizing my thoughts while the idea is still fresh in my mind. 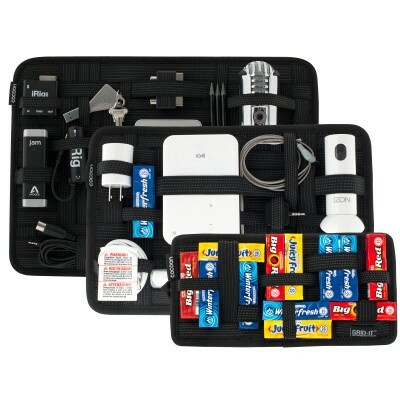 Whatever your technology, keeping it organized and tidy for travel can be a challenge. My preferred carry-on for research trips is the Northface’s Router Backpack, which has padded, secure compartments for your laptop and tablet. 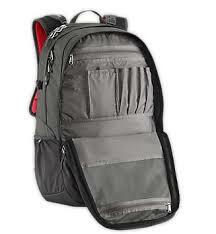 The bag includes lots of small pockets for things like reading glasses, your phone, charging cables, etc. The large electronics compartment has a TSA-friendly butterfly zipper, which (in most cases) eliminates the need to take your tablet and laptop out at security checkpoints at the airport. For short trips, I can usually fit a couple changes of clothes and a small bag of toiletries. I have also found that it typically fits under the seat in front of me on the plane. Another, more economical option for organizing smaller electronics (a smart phone, digital camera, chargers, etc), is the Grid-It, by Cocoon. The Grid-It is a woven board that grips and locks small devices and cables into place, to prevent them from rolling around in your bag. It comes in a couple of different styles and sizes, including one that has a built-in tablet or laptop case. NB: If your research involves international travel, Flight 001 carries a nice variety of adaptors and back up batteries, for those moments when your camera or smartphone battery doesn’t last quite as long as you hoped. The hyperlink to the Archive wiki leads to the wrong site. Just letting you know. Added benefit of Evernote, if you use their scanner/input photos and have a premium subscription, it will OCR the images to become text searchable (even handwriting — not always perfect, but comes in handy). Thanks, Katherine. OCR features are definitely handy, even if they aren’t always perfect. I also recommend CamScanner, which is a free phone app that automatically crops images (so you don’t have a ms page and pat of your desk in the image) and renders the image text searchable with OCR. It also automatically links with Dropbox, so you can upload files to safe and secure cloud storage as you go. A serious omission in the description of Zotero is the fact that it works closely and automatically with Microsoft Word and, indeed, all of Microsoft Office. Automatically plugging in a footnote or a reference as a Microsoft Word footnote is a great convenience. Evernote can’t do these things. Of the seven note-taking programs I have examined, Zotero is the only one written by and for historians. That’s a fair point. Thank you. I’m admittedly still a bit of a newbie to Zotero. There may be some things I’ve overlooked that more advanced/experienced users are aware of. Very nice post! Thought Id share a quick post on converting images of print text to plain text files so you can search across documents, engage in text mining, visualization and so forth. EverNote is my new go-to note-taking tool. I use it on my smart-phone for which I cary a small bluetooth keyboard. All the dexterity of a laptop with the convenience of a device smaller than even a tablet. Back in the office, I can simply copy and paste my notes into my word documents as needed. Though I warn you: keep an eye out for your appostrophes and quotes: they’re not the same as the default ones in Word. A quick search and replace fixes this problem. I have been using a Canon digital SLR, which has the advantage that it connects directly to my laptop — So I can save the images to folders with the same names as the archival boxes. I put a reversible tripod on the table (so the camera points down between the legs) and use “live view shoot” which allows me to see the image (before taking the shot) on the laptop screen. All this comes at the suggestion of my Dad, who is a retired prof of photography. I have a Canon G-Series Powershot (older), which works well, though certainly not as good as one of Canon’s digital SLRs (which I wouldn’t mind owning some day). And your filing/documentation strategy for images makes perfect sense. I’ve seen some researchers that prefer the PDF, in which case the software that saves you the tedious work of compiling everything into a PDF is wonderful. There are others who don’t like the limitations that converting to PDF places on changing the brightness, contrast, and other manipulations. And I see their point. If you’re working with a document that’s badly damaged, faded, has a lot of bleed-through, or cross-writing, sometimes the PDF is not your friend. I’ve occasionally brought both the camera and the iPad rig so that I can be prepared, since you never know what condition the documents will be in until you’re already there, working.